This image is captured in the clip art in this bundle. 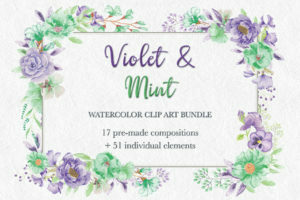 The bundle consists of 17 pre-made watercolor clip art items in hand painted pink watercolor daisies and green foliage, 4 patterns, and 17 individual elements. Create stationery and other items in minutes with the clip art, and personalize further with the individual flowers and foliage. 3 sprays and 1 posie. 3 borders (2 of these are seamless, repeatable borders). 2 card / page borders. 1 card / page template. The JPEG patterns have a color background. Also given in PNG format. The 2 repeatable borders measure 12 X 1 inches (3600 X 300 pixels). Spray 1 measures 8.5 X 4.75 inches (2550 X 1425 pixels). Spray 2 measures 8.25 X 9 inches (2475 X 2700 pixels). Spray 3 measures 6 X 7 inches (1800 X 2100 pixels). The posie measures 7 X 11 inches (2100 X 3300 pixels). 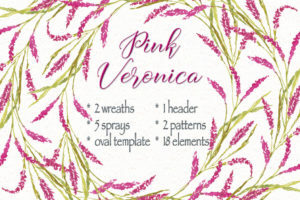 The 2 card / page borders, the card / page template and the header measure 7.5 X 10.5 inches (2250 X 3150 pixels). These reduce to a 5 X 7 inch card. Frame 1 measures 10 X 10 inches (3000 X 3000 pixels). Frame 2 measures 12 X 6 inches (3600 X 1800 pixels). For example, individual flowers measure 2.6 X 2.6 inches and 1.4 X 2.1 inches. Leaf branches measure 1.0 X 2.4 inches. Sub-folder 1 contains the 5 borders (JPEG and PNG) – 10 files. Sub-folder 2 contains the 17 elements (PNG) – 17 files. Sub-folder 3 contains the 4 patterns (JPEG and PNG) – 8 files. Sub-folder 4 contains the posie and the 3 sprays (JPEG and PNG) – 8 files. Sub-folder 5 contains the 2 embellished frames, the header and the template (JPEG and PNG) – 8 files. Sub-folder 6 contains the 4 wreaths (JPEG and PNG) – 8 files. 59 files in total. All files are clearly marked.